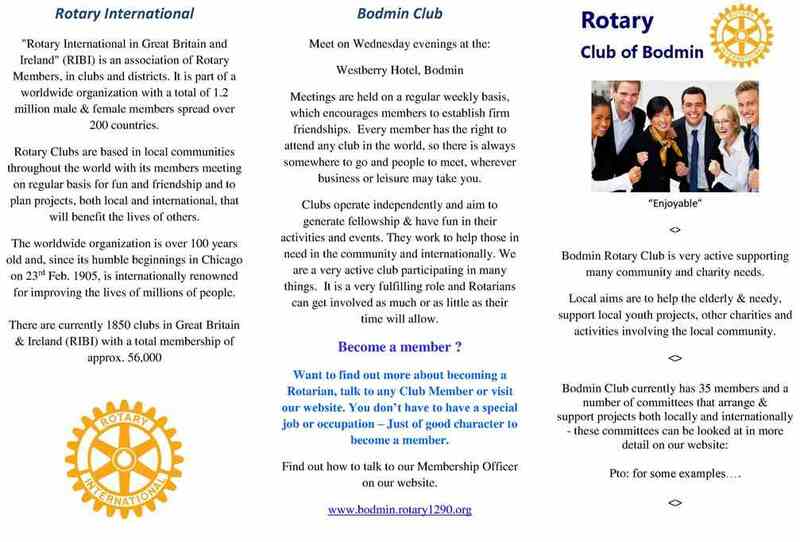 All about Rotary - International and Local. Ever considered joining ? How to find out more and who to contact re. 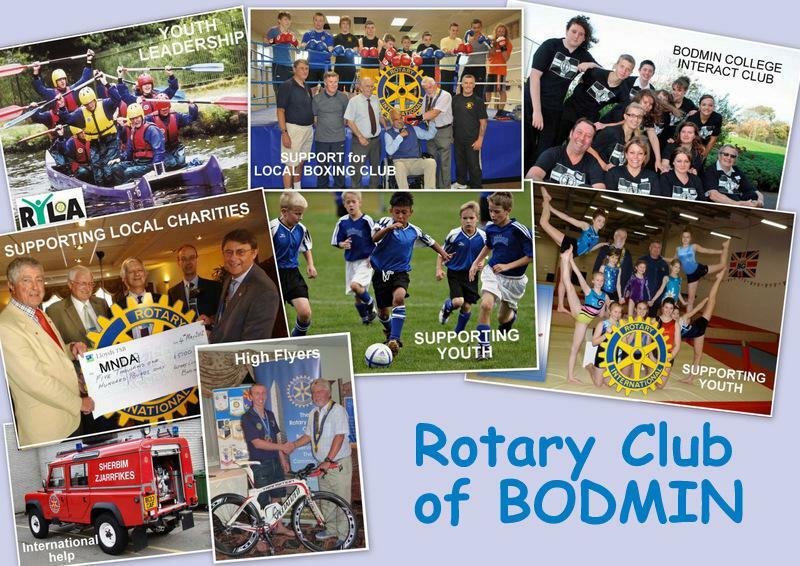 joining Bodmin Rotary Club. Membership Types: Discuss with Jeremy what might suit you ! ? "Rotary International in Great Britain and Ireland" (RIBI) is an association of Rotary Members (male & female), in clubs and districts. It is part of a worldwide organisation with a total of 1.2 million members who are professionals, managers and leaders spread over 200 countries. Rotary clubs are based in local communities throughout the world with its members meeting on a regular basis for fun and friendship, and to plan projects, both local and international, that will benefit the lives of others. The worldwide organisation is over 100 years old and, since its humble beginnings in Chicago in 1905, is internationally renowned for improving the lives of millions of people. RIBI has a professional Secretariat, based at Alcester in Warwickshire, which acts as an administrative centre for Rotary activities for the 29 Districts and 1,855 clubs across Great Britain and Ireland. Rotary International has its world headquarters in Evanston, near Chicago, Illinois, USA. If Rotary sounds like the organisation for you, we'd like to hear from you! Simply send an email to us giving your name, address and postcode and we will get in touch. When you join Rotary, you can be sure that the enormous sense of achievement that you'll experience helping your local community - and even communities around the world - will be matched by the fun that you'll have doing it! Clubs all over West Devon, Cornwall and the Isles of Scilly have ambitious plans, so they're looking for more men and women to bring their energy, business skills and sense of humour to make a real difference to the lives of others. Every Rotary club has a different 'personality' and offers a different range of benefits so it's well worth trying out a few of your local clubs and meeting their members to find the one that suits you best. 2014/15 Flyer Text - The reverse of this page is the multi photo above. A public Information Page on the structure of Rotary.